Dennis and SISIS will once again be exhibiting at BTME 2018 on stand A5 where greenkeepers, course managers and turf managers will be able to view an extensive range of turf maintenance equipment. With a focus on aeration, scarification and mowing, visitors to the joint stand can look forward to finding out more about these products as well as speaking to experienced staff who will be available to answer any queries and offer valuable advice. Featuring prominently on the stand will be the SISIS Javelin Aer-Aid 1500 tractor mounted vertical action aerator and the SISIS TM1000– a tractor mounted scarifier. The Javelin Aer-Aid recently gained rave reviews from the STRI (Sports Turf Research Institute). Over a three month period, extensive STRI trials led by Dr Christian Spring were carried out which examined how and if the Javelin Aer-Aid had an effect on the hardness of the turf, the root depth, water infiltration and disease. The SISIS TM1000 is a purpose designed, tractor mounted scarifier with a choice of five contra rotating quick release reels for maximum thatch removal and minimum surface disturbance. The floating unit follows ground contours closely without scalping, while depth of operation is easily adjusted with a ‘no tool’ depth setting. 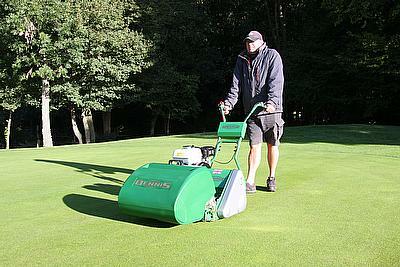 Also featuring from the SISIS portfolio will be the Auto-Rotorake MK5 pedestrian scarifier. Offering versatility with a range of contra-rotating quick-release interchangeable reels including scarifying, verticutting and brushing, the machine is renowned for its ease of use. From the Dennis range, visitors will be able to view the Simplex and FT510 mowers. The Simplex has a 510mm (20”) operating width with a choice of 5 or 7 bladed cutting cylinder. Easy height of cut adjustment and a two-piece rear roller which gives easy turning makes this an ideal mower for golf tees and ornamental club lawns. The Dennis FT510, which has a cutting width of 510mm (20"), will also be showcased at the exhibition. This unique mower has a range of 12 interchangeable cassettes meaning that one machine can be used for several key maintenance tasks from cutting, scarifying, verticutting or brushing. BTME takes place in Harrogate, North Yorkshire, from 23-25 January 2018.